Back in 2014, you may recall, I told you of the dreadful Clown Epidemic that afflicted the world at that time. 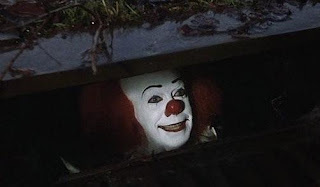 If that was an incredibly proactive advertising campaign for that freaky "It" movie that opened in September, it seems to have worked, since it's grossed $305 million at the box office. Of course, it's hard to balance that against the cost of three years worth of clowns but New Line Cinema probably at least broke even. caught and interrogated about their clownishness. Those that were generally turned out not to be ancient transdimensional creatures that eat children for breakfast. However, their motives were murky and they tended to disappear down storm drains before they could be questioned. 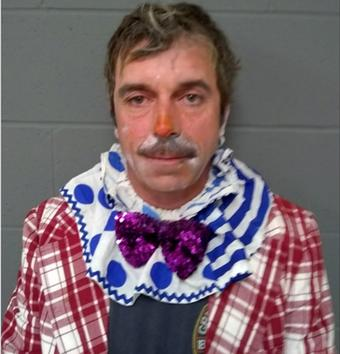 But now a clown has been caught and unmasked in Vermont. It turns out that creepy clowns are actually 43-year-old guys looking for a place to sleep off a bender. This particular clown was just too inebriated to find a storm drain.